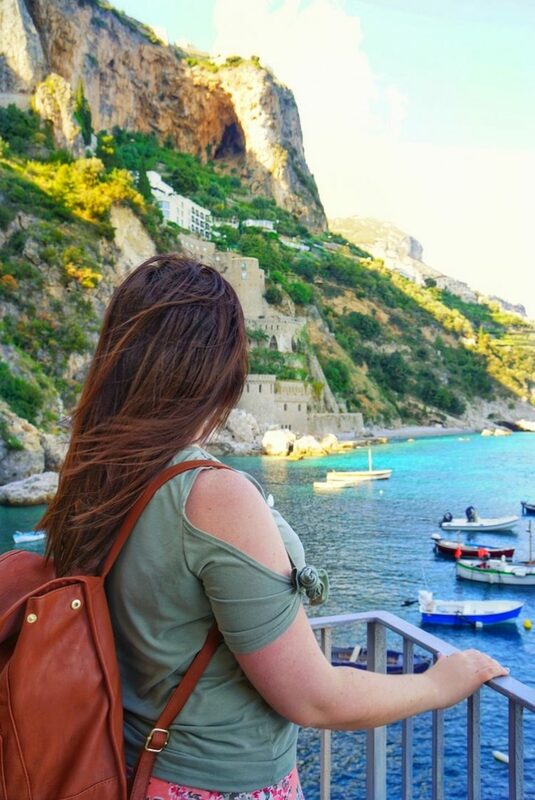 Conca dei Marini is a small village along the Amalfi Coast in Italy and it’s the perfect place to escape the crowds and experience the beauty this region has to offer. 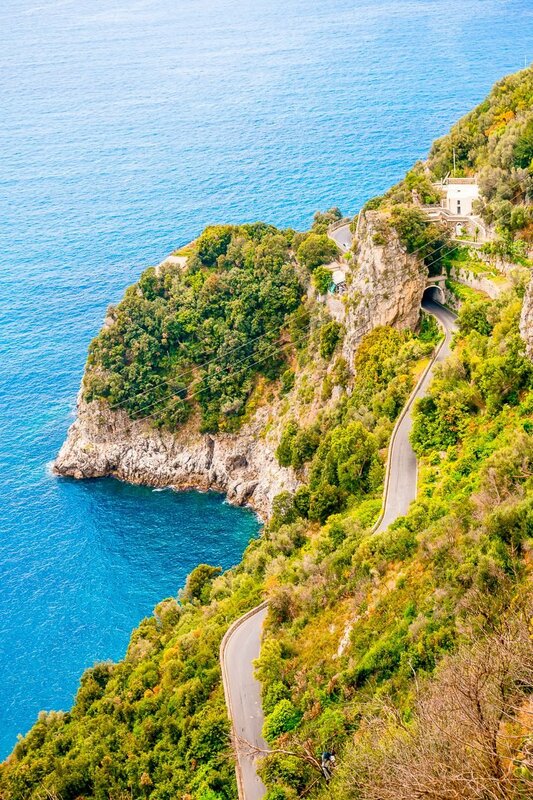 I’m pretty sure almost everyone has heard of Italy’s Amalfi Coast that sits just on the other side of the Lattari Mountains from Naples. 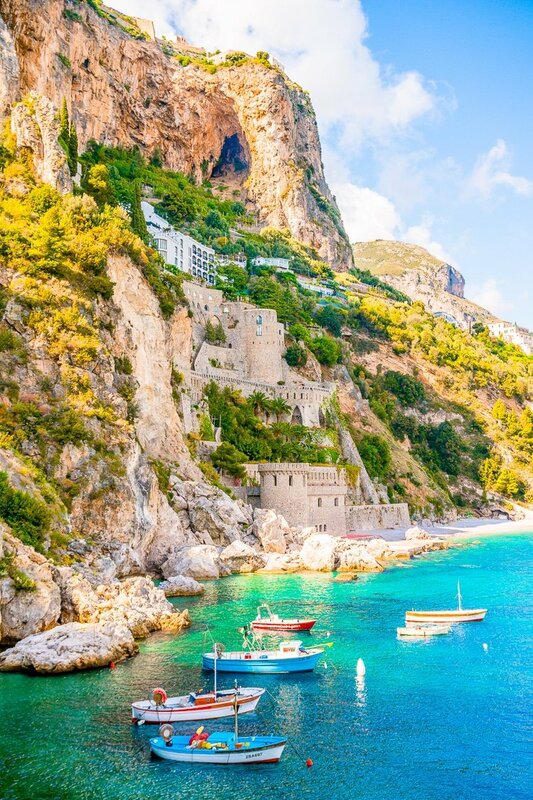 When most people visit this colorful coastline, they usually stay in the larger, popular villages of Positano, Amalfi, or Ravello. 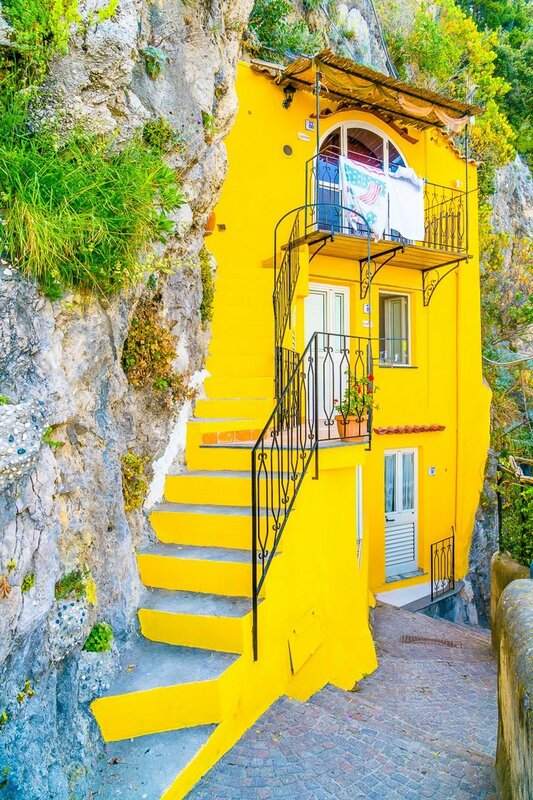 But did you know that there are actually thirteen villages along the Amalfi Coast? 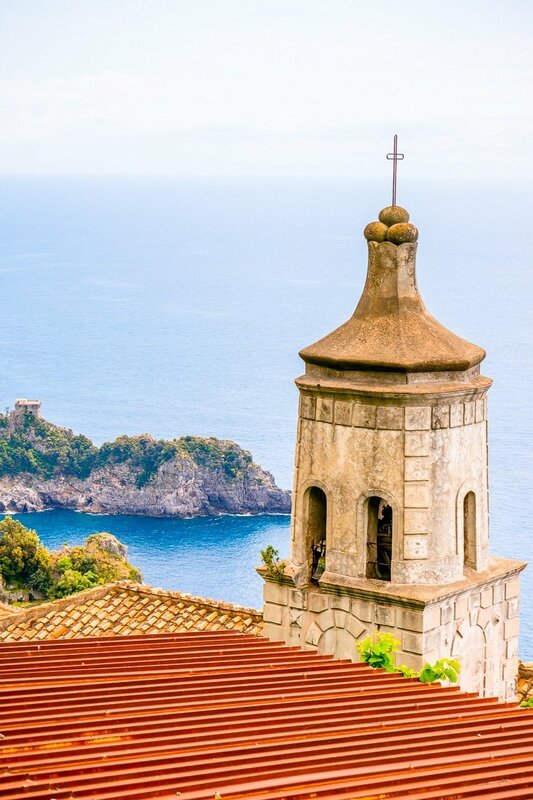 And Conca dei Marini might just be its hidden gem. 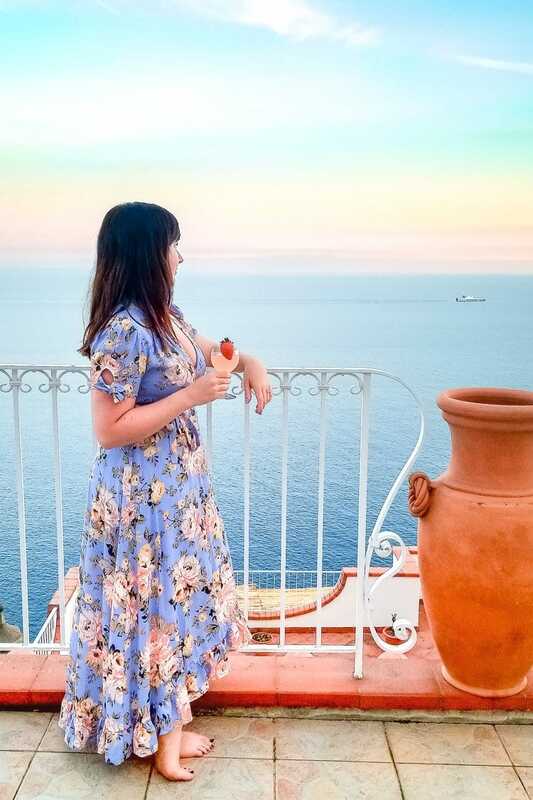 Earlier this month we spent almost two weeks in Italy, exploring Rome and the southern part of the country and decided to plan a short stay on the Amalfi Coast. So even though we only had one full day here we made the most of it. I’ve never been one for crowds, in fact, I’ll pretty much do anything I can to avoid them. 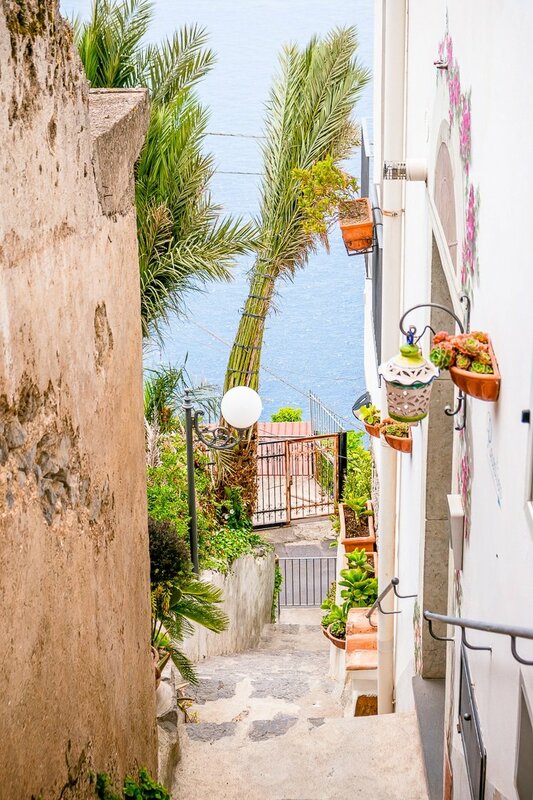 So as gorgeous as Positano looks in pictures I really didn’t want to fight the crowds that were sure to be there. So, in the end, we decided to stay in one of the smaller, quieter villages. 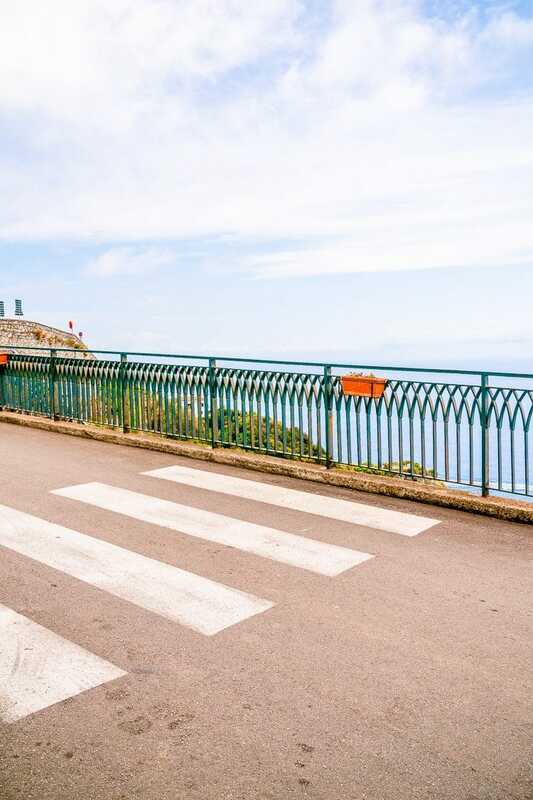 Conca dei Marini is a charming place, as long as you don’t think about the hairpin turns up and down a mountainside that you need to navigate in order to get there. It gave us some serious flashbacks of driving in Scotland. Pro Tip: Maybe just take the ferry from Naples and save yourself the $886.00 scratch on the rental car 😉 Or at least beg the rental car company for the smallest possible car – I’m thinking along the lines of Just Married small. Trust me, I’m speaking from experience. But what awaits you on the other side of the mountains is more than worth it. We’re talking aquamarine waters, lush greenery, and a bazillion stairs. Okay, so maybe the *worth-it* factor of the stairs is questionable… there were about 700 of them between our Airbnb and the beach and my thighs hated me for days after. 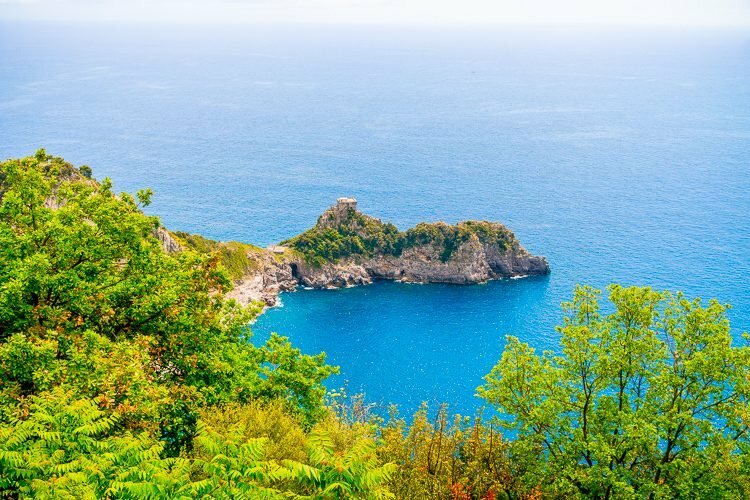 So while it’s obvious that Conca dei Marini is a beautiful place, what exactly is there to do? Well, honestly, not a ton, but there’s still plenty for one day of exploring. 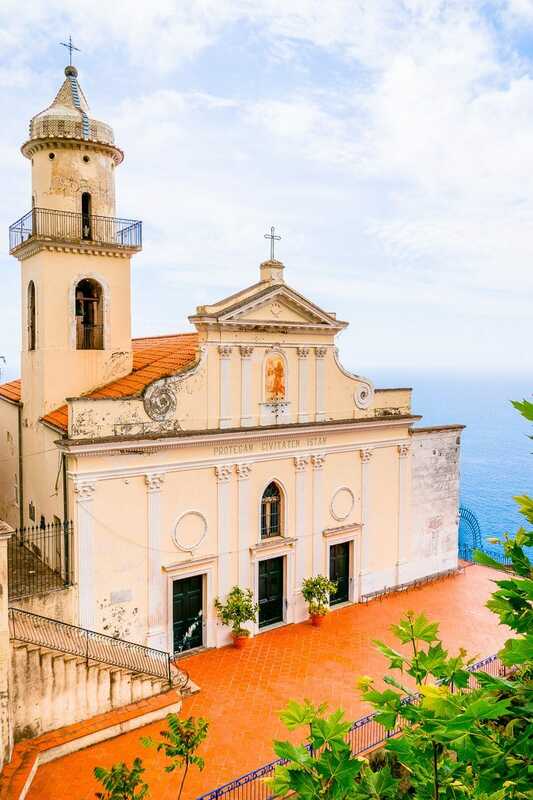 If you’re planning to stay longer on the Amalfi Coast, you could still use this quiet village as your base and use the network of buses and ferries to explore the rest of the coast and even head out to Capri. 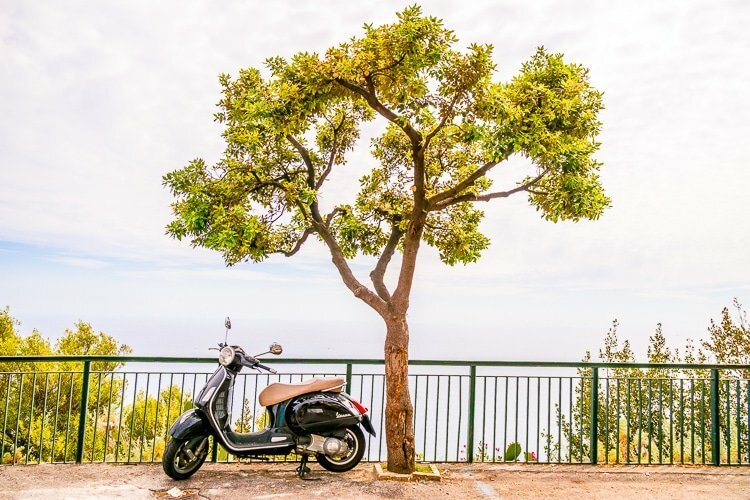 Wake Up Slow – If you’re lucky enough to stay in a place with a view of the water, sleep with the windows open and let that salty Mediterranean air roll in. Better yet, if you have a balcony, spend the morning out there with a good book and an espresso. 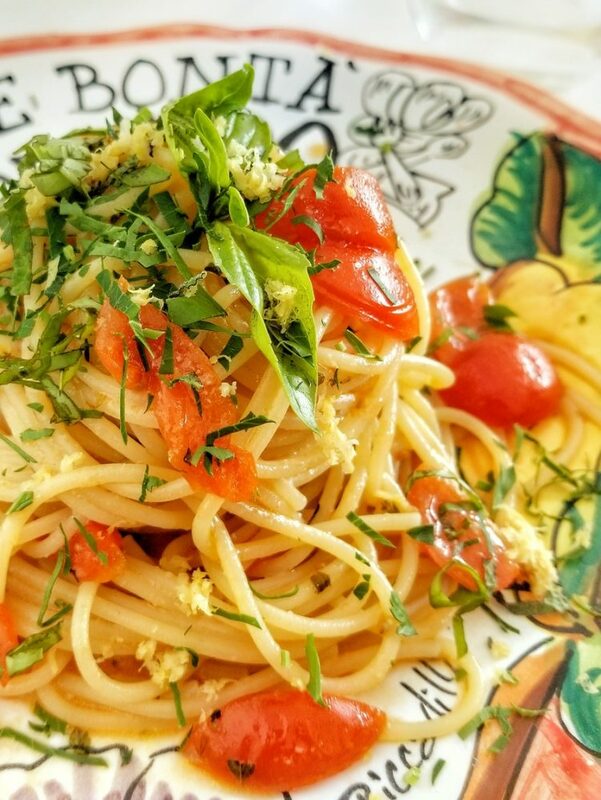 Lunch at Le bonta del Capo – We all agreed that this was by far our favorite meal during our trip to Italy. Everything was so fresh and delicious and CHEAP! Not kidding, my main course (Speghetti 7 Odors) was €8.00 and my appetizer which was a giant slice of Eggplant Parmigiana was just €4.00. And you absolutely must get the roasted peppers too – AMAZING! Grotta dello Smeraldo – This cave has been partly inundated with sea water and is the top attraction in Conca dei Marini. This cave cannot be accessed from the sea (unless you’re diving), but there is a parking lot and a set of stairs and an elevator that will take you down to see it’s emerald green waters. Once you arrive in the cave, you’ll board a boat which will take you around the grotta. It’s a bit of a tourist trap, but it only cost €5.00 per person and takes less than 30 minutes or so to do. Piccadilly – If you’re looking for some handmade treasures to take home with you, this is the place to go! A ceramics factory with a storefront and you can even have custom pieces made and shipped back home for you! 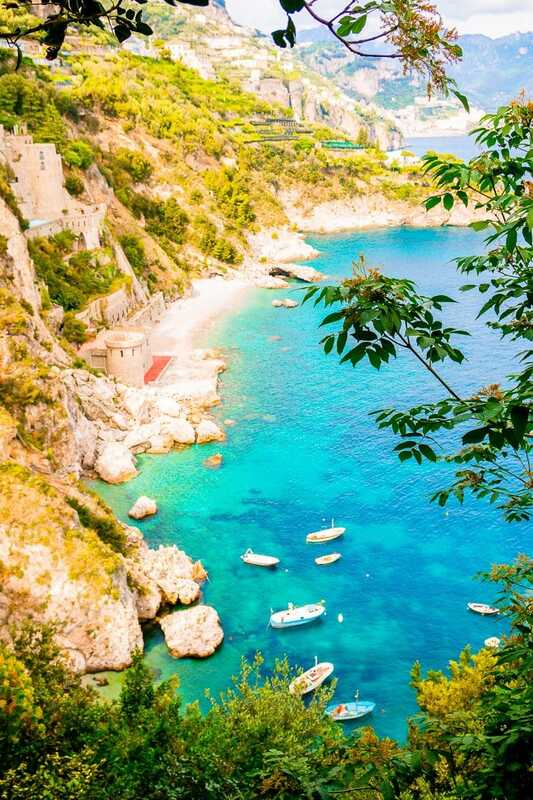 Marina di Conca – Conca’s beach nestled between the cliffs and turquoise waters is an absolute must, just be aware that there’s a lot of stairs to descend before you get there. And because of its location, the beach is generally shaded from early afternoon on, so plan accordingly if you prefer sunbathing over swimming. La Tonnarella – We didn’t eat here, but our host said that it’s the best of the restaurants on the beach, of which there are three. So if you’re ready for some dinner, grab a bite! Market L’angolo della spesa – If you want to stay in and cook or grab some snacks. Walk Around – Because what I enjoyed most about this place was just strolling the streets and absorbing the views and culture. Here are some more photos of this pretty destination! Don’t forget to catch the sunset! My dress is from Francesca’s, you can find it here in an alternative color or check your local store for this one. Great post! My husband and I drove through and went to the grotto. However didn’t get to explore. What time of day did the beach get shaded, and what was best time of day for your photos? Hi Kim, I believe we were down by the beach around 2 – 3pm, so I would say this part of the beach is probably only sunny in the mornings. I took these photos around the same time. There was still plenty of sunshine on the southerly facing shore.